One of my favorite things to do in New York is to walk through the Farmers Market at Union Square early in the morning. Its such a nice feeling to know that local produce does exist and honestly looks more satisfying than much of the produce at many grocery stores. Therefore, when I discovered that my local town in Georgia conducts a Farmers Market of their own every Saturday, I instantly knew I had to be there. Visiting Marietta’s Farmers Market reminded me many of the smaller Farmers Markets in the city including the Upper West Side, Chelsea, and the West Village amongst others. 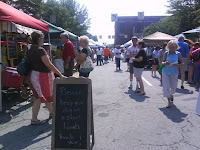 The Marietta Farmers Market designates only one street in the Square for the vendors. Everything from produce to baked goods to soaps, all vendors naturally produce their goods to be bought and sold by the local public. Other vendors included local farms in north and south Georgia providing most Georgian staples during this time of year including corn, tomatoes, zucchini, cucumber, herbs, blackberries, blueberries, and what is now left of strawberries. Do not even worry about eating before visiting the market. The vendors have so many samples eagerly waiting for their customers that one could almost have their breakfast from sampling the street. Would I go back? Absolutely. Honestly, I cannot wait until the following weekend so I can get my hands on the goods I did not get to try the first time I visited. 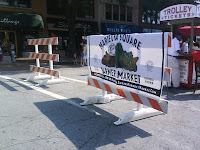 The market is closed this weekend for the Fourth of July but the following link is the official website: www.mariettasquarefarmersmarket.net . I first experienced this packaged piece of chocolate at my local deli in Queens and cannot get away from it ever since then. Two bars filled with layered solid milk chocolate may not seem like much but the intensity of the milk chocolate had my mouth water at first bite. 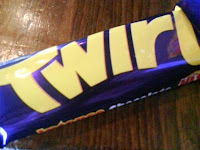 When I decided to make the temporary move south, I never thought I would be able to see Twirl again. Luckily, I discovered a newly opened British goods shop that sells the purple package at roughly the same price I was paying in Queens. The local food movement may be picking up pace in today’s society, but I must admit that its hard to turn the Twirl down despite it coming from thousands of miles away. I just received July’s issue of Bon Appetit after writing this entry which had, you guessed it, an enormous, juicy turkey burger printed on their front cover. They must have been reading their subscribers’ minds. Oh well. In any case, I have been craving a burger, but having a heavy beef hamburger is sometimes not too appetizing due to the humid heat. I found some ground turkey meat in the grocery store and decided to get a little creative by using my father’s recipe for beef hamburgers only changing one or two items. I replaced Italian bread crumbs with plain and the Worcestershire Sauce with lime juice. Enjoy! 1. Place ground turkey meat in medium mixing bowl. Add egg, bread crumbs, and lime juice. Mix with fork or hands until blended. 2. Using hands, form 4 patties about the size of a fist. 3. Place on heated grill. Cook until desired. I usually prep toppings while patties cook. 4. Place cheese on top of patties in the grill. Allow to melt. 5. Remove patties and place onto buns. Add toppings and serve.